Coupons must be for products sold at Menards & must be presented at the time of purchase. Only one coupon per item. For example, you cannot use a manufacturer coupon & a Menard coupon on the same item. Item purchased must be identical to the coupon (size, quantity, brand, flavor, color, etc). Manufacturers’ Coupons & Competitors’ Coupons will be enforced per the individual coupon’s rules & regulations. Example: Coupon states, “Limit one coupon per purchase.” This means that one coupon can be accepted per item, not transaction. There is no limit on the number of coupons per transaction. All coupons must have an expiration date & be presented within the valid date. Expired coupons WILL NOT BE ACCEPTED. Coupon amount may be reduced if it exceeds the value of the item after other discounts or coupons are applied. We cannot give cash back if the face value of a coupon is greater than the purchase value of the item. All applicable sales taxes are paid by the Guest at the full value of the item. 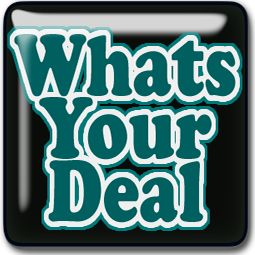 Any coupons stating, “Not valid with any other discount or offer” will not be valid with sale priced items. 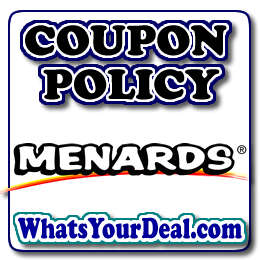 Menards reserves the right to accept or refuse coupons at its own discretion. Menards does not discriminate on pricing. We charge the same low price to all without regards to race, creed, age or occupation. this information was obtained HERE and is also found here. Menards guarantees competitive pricing. If you find a lower price on an identical item in a local retail store, Menards will beat their price by 11% when you purchase the item from Menards. Bring in the current competitor’s circular and present it at checkout. The price guarantee does not apply to competitor close-out, special order, clearance, discontinued, liquidation, and damaged item prices. Rebate offers, those requiring trade-ins, or other conditions to gain the competitor’s lower price may also be excluded. Menards reserves the right to exclude offers including, but not limited to, availability and/or special promotional offers. Any conditions required to make the purchase will also be required at Menards. Limited to reasonable quantities for home-owners and one-house contractors. Current in-store prices, if lower, overrides Menards advertised price. Q: Does Menards offer rain checks? How do they work? A: Menards issues “Sorry Slips” on out-of-stock advertised sale items only, unless the advertisements states “while supplies last”, “no rain checks”, or “limited quantities”. Rain checks will not be issued for items not carried at Menards.